The keyboard itself is really nice. The keys and the "noise" are about what i was looking for and the layout is very comfortable.The synapse software for controlling and remapping it is complete garbage on macos though. I found after running into some issues that it's apparently a very common problem that key remapping with synapse leads to "sticky" keys (the system starts acting like a key is being held down even though you are not touching the keyboard). I have since disabled the software and i am just using the native key remapping to accomplish what i want.One other personal thing... I can do without the super bright green logo at the front of the keyboard. The only way to disable it is with the synapse software (which causes problems on the mac as i stated) and if i wanted bright lights on. My keyboard i would have gotten the chroma edition. After about a week of use the shift key began to stop responding at random times when holding it, extremely disappointed. Never going to buy a razer product ever again. Great for gaming or just everyday computer use. Razer makes the best mechanical keyboards. We have been so satisfied with our first that everyone in the house has replaced their keyboards with a razer keyboard. It feels great and is really responsive, as well it is relatively cheap and small compared to my blackwidow v2 yellow switches or my ornata destiny 2 i use as my daily driver which is perfect for bringing to school and carrying it around or leaving at home for my second temporary set up mainly for typing than gaming but after playing osu for an hour and mashing the z key it started to get unresponsive and it started to mess up my game. I had to rebind my keys to the x and c key instead of z and x because it started to have problems. I really like this keyboard but seeing how mashing it breaks the keys leaves a lot to be desired because ive used my blackwidow v2, ornata chroma, a laptop keyboard and a membrane keyboard from kengsinton and after using those for months mashing the z and x key on osu, the keys still work like charm. I blame kailh for there crappy keys. This is why razer switched to the better greetech which is a lot better quality. Still a nice keyboard to type on after trying a lot but now that my z key is semi broken i think its a better idea to go with the v2 if i had 110 to spend instead of using 60 to buy this knowing this would happen. And it doesn't help that i just got this 2 days ago and started to use it today 7/20 then for it to start malfunctioning during an online game in just 2 hours. For now im going to stick with it because at this point i can deal with it.Update: i recently started to play osu with d and f and after 1 day of mashing it as well started to the same with the z key but when i went back to z and x it was magically fixed but the problem is that now i use d and f not z and x. 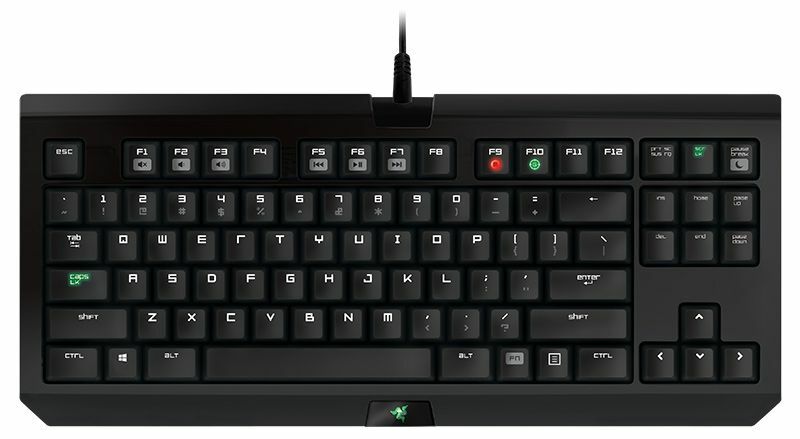 It doesnt make any sense because when i used z and x on a membrane keyboard an a laptop scissor switch keyboard mashing z and x for the past 7 months nothing happened and i used a mecha membrane from razer mashing z and x for 5 months and nothing happened. I used d and f on my blackwidow v2 for 3 days straight and again it worked like a charm in fact better than my other keyboards. Id expect this older model black widow to not break in fact ive had friends who owned a black widow longer than me and theirs havent broke yet, ive only had this for 2 weeks and after a day the z key breaks then magically fixes and now my normal d remaping is screwed up after 2 days of mashing and clicking circles. Do i look like im farming maps on dt come on ive seen much worse on pro players keyboards using the same keyboard so this shouldn't be happening to mine. I bet later my dd key would be magically fixed again. I really like the clickiness and the fact that it has no backlighting. After using it for almost two years, the usb connection seems kind of flaky and i find myself having to unplug and plug the keyboard from my laptop sometimes. Still love using it though. I personally really enjoyed having a smaller keyboard with no num pad. This is perfect for a minimalist set up or a small desk. The switches take some getting used to but overall, i really enjoyed this product.